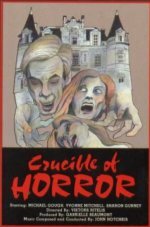 In this effectively spooky thriller, a tyrannical stockbroker (Michael Gough at his beastliest) torments his wife and daughter to such a degree that they decide to murder him. Those who have seen Les Diaboliques will recognise the remainder of the plot. Writer Olaf Pooley (who also plays a nosey neighbour) does not play fair when it comes to the explanation. But director Viktors Ritelis, another TV talent whose film career went nowhere, wrings such tension out of every shocking development, that one is prepared to forgive the underhandedness. Shelved for three years before a spotty theatrical release, the film subsequently made its mark among genre fans.